The Saints. The Colts. And you, slathered in hot cheese. Fondue and football, together at last. Being a football fan doesn’t actually require you to spend Super Bowl Sunday elbow-deep in a bucket of wings, or mainlining poppers, sliders, and other foods from the “–er” family. 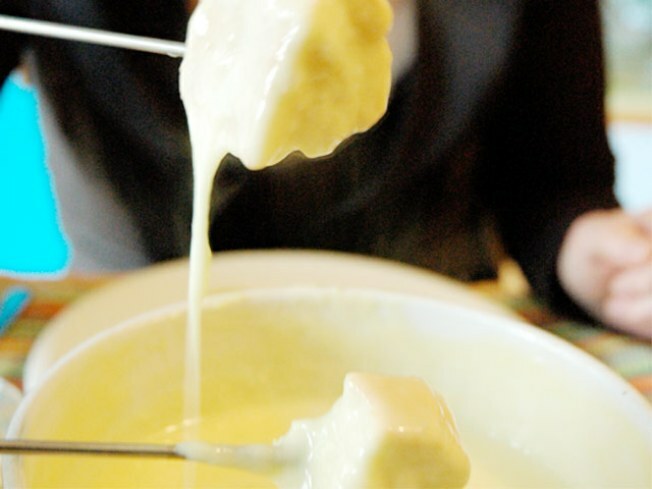 Confound all expectations, and pair your pigskin love with fondue! At temple-of-cheese Artisanal – where they’re serving a different fondue for every day of February – they’re throwing a Fondue Party for Super Bowl XLIV, and ladling out two types of the gooey goodness: An appropriately all-American Monterey Jack from California, served with black beans and chipotle peppers, and their special Artisanal Blend of cow-milk cheeses from the E.U. (where football means something else entirely). Do your dipping with baigneuses like kielbasa, air-dried beef and fingerling potatoes. The game will be screening on Artisanal’s 82-inch screens. Reserve early, and please: No face-painting.